Incoming iPad 3 to Offer Retina Display? The iPad and iPad 2 were both released in the Spring. If Apple keeps with said trend, iPad 3 production might already be underway. According to DisplaySearch analyst Richard Shim, the iPad 3 display has already begun production, boasting an impressive 2048×1536 resolution. Speaking with CNet, Shim confirmed that the new displays are being supplied by Samsung, Sharp and LG The trio of manufacturers are responsible for creating a large volume of display panels in time for the product launch sometime next year. The first two iPads shared identical IPS displays, sporting a 1024×768 resolution. Considering the use of Retina Display technology with the iPhone 4 and iPhone 4S, enthusiasts expect Apple will bump the resolution of the third iPad by a bit. Shim additionally mentioned that Apple is considering an eight inch tablet to occompany the full sized iPad. Considering the suspected success of the recently released seven inch Kindle Fire, it’s not surprising that Apple is considering a smaller form factor. 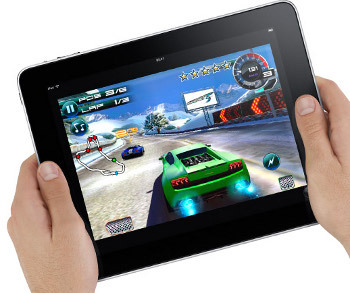 The analyst doubts a downsized iPad will be available before the second half of 2012.